Post written by Guilherme Piovezani Ramos, MD, from the Department of Internal Medicine, Mayo Clinic, Rochester, Minnesota, USA. We aimed to assess safety and effectiveness of endoscopic intervention for management of gastrointestinal bleeding in the setting of thrombocytopenia. Thrombocytopenia is frequently seen in populations at higher risk of gastrointestinal bleeding, such as patients with liver cirrhosis and hematologic malignancies, but there remains a lack of robust data to determine the ideal cutoff platelet count for safe therapeutic endoscopy. To the best of our knowledge, this is the largest study on the outcomes of endoscopic intervention in hospitalized patients presenting with overt gastrointestinal bleeding and severe thrombocytopenia (PC <50X103/ml). Current societal guidelines determine a threshold of >50X103/ml, based on expert opinion only. Furthermore, prior studies on the subject focused on the management of bleeding of hematologic malignancies not approaching the difference between this and other thrombocytopenic populations, like patients with liver cirrhosis. Our analysis, from a single tertiary center, showed that endoscopic intervention for gastrointestinal bleeding in the setting of severe thrombocytopenia has a moderate diagnostic (68%, 61% in liver cirrhosis versus 79% in non-liver cirrhosis) and therapeutic yield (60%, 59% in liver cirrhosis versus 61% in non-liver cirrhosis) with a relatively low complication rate (1/86 interventions). Initial endoscopic hemostasis was successfully achieved in the majority of patients but re-bleeding remained in both patient populations. Endoscopic hemostasis was also associated with a decrease in packed red blood cell and platelet transfusions in the entire cohort. Overall mortality of our cohort, in both liver cirrhosis and non-liver cirrhosis, was comparable to mortality rates in non-thrombocytopenic populations reported in the literature (Figure 2), indicating no added risk in attempting interventions in these patients. Interestingly, we were also able to identify predictors of high-risk populations where endoscopic intervention should be avoided. An INR > 2 was a predictor of re-bleeding while an elevated INR (>2) and aPTT (>38 seconds), pulmonary comorbidities, and admission to ICU were predictors of mortality. These predictors can be used to assist the primary teams and endoscopists in the decision of pursue or not with endoscopic intervention in patients with low platelets. Figure 2. 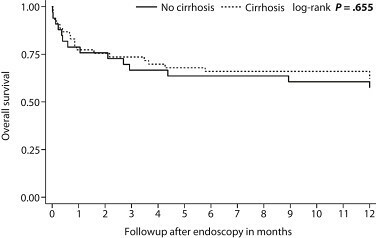 Overall survival for cirrhosis versus non-cirrhosis in those who underwent intervention (n = 86). 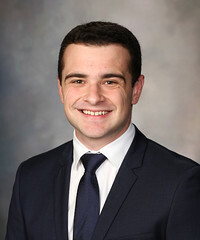 Our results support that endoscopy is relatively safe with a moderate diagnostic and therapeutic yield and, therefore, should be considered as a reasonable management strategy in both liver cirrhosis and non-liver cirrhosis patients presenting with overt gastrointestinal bleeding when the platelet count is below the threshold established by current guidelines. The results of the present manuscript open the possibility for the development of future prospective studies looking at comparative outcomes of endoscopy in thrombocytopenic and non-thrombocytopenic patients in the attempt to determine the appropriate platelet-count threshold for safe and effective endoscopic procedures.